You have probably already made some resolutions for 2017 and are hopefully still sticking to them. You may have decided on trying to save money, changing your job, or to living a healthier lifestyle. One aspect of a living a healthy life is to improve your dental health. It may sound daunting, but it is actually quite easy to get a brighter, healthier smile this year. Dental resolutions can range from improving tooth brushing habits to completing delayed dental treatment. It may even include, finally moving forward with that elective procedure that will create your best smile. Whatever your goals may be, it is important to take small consistent steps to achieve them. At Generations Dental, we are here to help you achieve these goals. Here are a few suggestions to make 2017 the year of your healthiest, brightest smile. Improve your brushing and flossing habits – Brushing and flossing protect your teeth from decay (cavities) and gum disease. They are both equally important for good oral health. The goal of brushing and flossing is to remove plaque – a sticky, colorless, film of bacteria that builds up on your teeth all day long. Brushing removes plaque from the biting part and smooth sides of the tooth. Flossing is needed to remove plaque from in between the teeth and below the gums – which are areas that cavities and gum disease often start. To ensure all plaque is removed, it is best to brush 2x a day for 2 minutes each time. If you MUST to skip out on a brushing session for the day, skip the morning session because you don’t want bacteria sitting on your teeth all night while you sleep. Floss at least 1 time a day to remove food debris and plaque. A gold star finish to all this brushing and flossing would also include an antibacterial, fluoride mouth rinse for 30 seconds. Quit use of any tobacco products – Cigarette smoking and smokeless tobacco use can be detrimental for your oral (and overall) health. Tobacco products increase your risk for tooth discoloration, gum disease, tooth loss, and oral cancer. There is no better time than today to make a resolution to break a tobacco habit. Consider free online tools, cessation groups, mobile apps and support from friends and family to help you achieve this goal. Make healthier food and beverage choices – Frequent consumption of food and beverages containing carbohydrates (sugars) and acids contribute to tooth decay (cavities). Acidic and sugary beverages include soda, juice, and sweetened coffee, tea or water. Water is a healthy drink choice, but water infused with acidic foods like citrus can weaken enamel if sipped all day. Sugary snacks like raisins, candy, sweets, crackers and chips can all be cavity causing. Acidic foods like citrus, pickles, and tomatoes can also cause tooth damage. When it comes to tooth health, the key isn’t necessarily linked to how much of a certain food is consumed, but how often. Try to snack smart by consuming carbohydrates and acids at meal times and sticking to tooth friendly snacks like raw veggies, cheese, nuts, and plain water between meals. If you are worried about a sugary snack, rinse with water after eating to wash most of the snack off your teeth. Improve your smile – If there is something you would like to change about your smile, what are you waiting for? 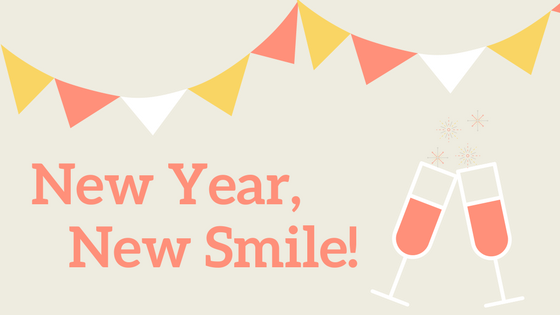 Make 2017 the year you gain confidence in your smile again. Maybe you want to whiten your teeth. Maybe you have been putting off braces to set things straight or fix a bite problem. Maybe you have been putting off those fillings that will bring your mouth back to ideal health. Whatever change you want to make, we can help you at Generations Dental. Check out our Services page to see all the ways we can help. Visit your dentist regularly (hopefully it is us) – Many people put off the recommended 6 month check-up because they do brush and floss at home and nothing is really bothering them. They don’t want to waste the time and money on what they perceive as a fairly clean and healthy mouth. What they don’t realize is that when they go to a “cleaning” appointment, it is really a full mouth check-up where the dentist and dental hygienist can monitor the condition of their mouth and develop an appropriate treatment plan for their wants and needs. It is also the time that the hygienist can remove plaque, calculus (tarter) build-up and surface stain to return the mouth to its healthiest state. Regular care is the key to keeping dental emergencies at bay. Smile more – Studies show that not only does smiling brighten someone else’s day, but also makes the smiling person happier. A smile makes you appear more approachable, more confident and more trustworthy. So smile this year, because you deserve it.